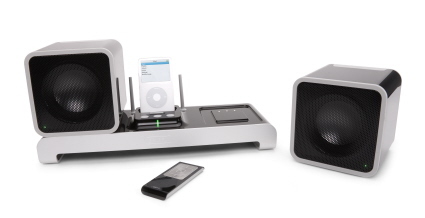 The next generation iPod docking station is now here, and it's called EVOLVE. 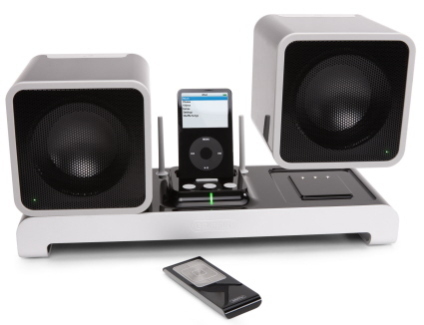 This portable iPod boombox is only 15 inches wide, and it features wireless speakers. EVOLVE is compatible with pretty much any iPod on the market right now, including the iPod Touch. It will also integrate with CD, MP3 players, MiniDisc players, TV's, and stereo receivers all via auxiliary audio inputs. EDITOR'S NOTE The Evolve iPod Docking Station is no longer available. You may want to consider these other iPod Docking Stations instead. What makes this device so impressive is its wireless speakers which have a 150 feet range. So EVOLVE will allow you to put speakers in separate rooms or outside, while the iPod is docked inside. You can operate the system with the included remote control, which also has a 150 feet range. Each speaker has a built-in rechargeable battery that lasts up to 10 hours on a full charge. When the battery gets low, just place the speaker back in its dock and it will automatically charge up. The iPod docking station will charge up the iPod as well. Each speaker is a 4 inch driver that operates on the 900 MHz frequency. Because there is not much interference at this frequency, the sound quality is said to be that of CD quality sound. The maker of EVOLVE is Griffin Technology who are rumored to be coming out with a subwoofer to go with this system very soon. There is also talks of a surround sound system similar to EVOLVE. EVOLVE can be purchased at the manufacturer's website for $299.